Almost a month after the March 6th, 2019 formal release of "Exploration, Imagination, Innovation - A New Space Strategy for Canada" by the governing Justin Trudeau Liberals, it's becoming increasingly obvious that the new Canadian space strategy is simply not the comprehensive "whole of government review" of activities, policies and legislation expected. According to the February 23rd, 2015 Treasury Board of Canada Secretariat website on the Whole of Government Framework, since 2005 the Treasury Board has "supported the development of a common, government-wide approach to the collection, management, and reporting of financial and non-financial information on program objectives, performance, and results." 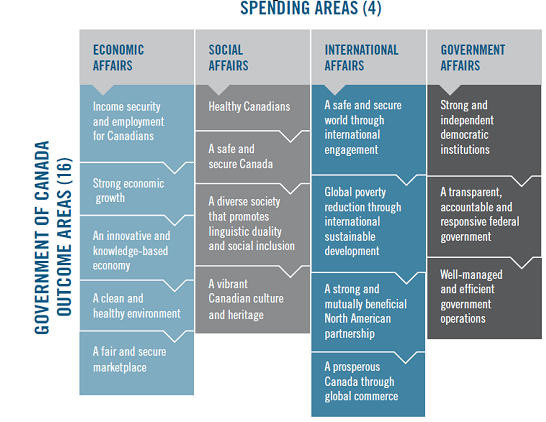 The whole-of-government framework maps "the financial and non-financial contributions of departments, agencies, and Crown corporations receiving appropriations to a set of 16 high-level Government of Canada outcome areas within four Government of Canada spending areas—Economic, Social, International, and Government Affairs." Graphic c/o Treasury Board of Canada. At the very least, it's certainly not a long-term space plan. 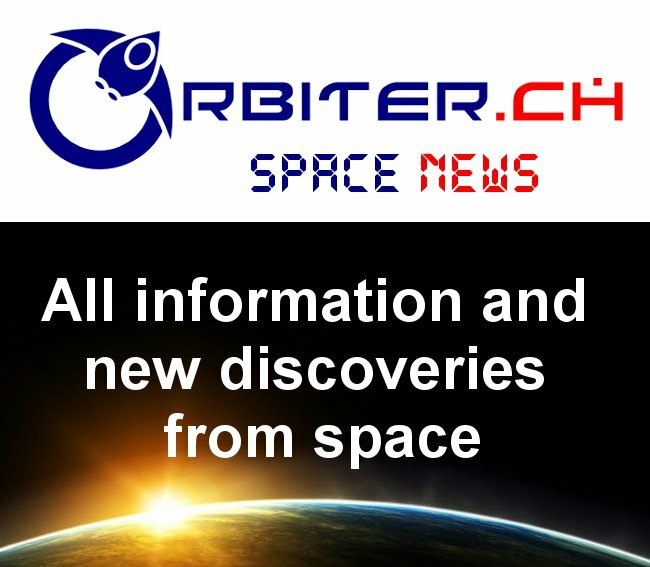 It is instead a very limited listing of upcoming Canadian Space Agency (CSA) activities and priorities focused almost entirely around component contributions to the US led Lunar Gateway, a program currently in a state of flux. It's not that there's anything wrong with that. It's simply that, after waiting for over fifteen years for something a little bit more comprehensive and perhaps a little more Canadian, we were hoping for better. For example, the new plan doesn't really reference other space focused initiatives from other Federal government departments, such as the new Canadian Minerals and Metals Plan (CMMP), a Canadian government program last discussed in the March 4th, 2019 post, "The New Canadian Minerals and Metals Plan Stakes its Claim on the Space Industry." The new plan doesn't really reference academia or the private sector either, except perhaps to congratulate them for their past accomplishments and to offer up a few more opportunities for funding. The new Canadian space strategy isn't even really a self contained plan since its primary justification is as a smaller component of the Liberal’s 2017 Innovation and Skills Plan which is focused almost entirely around jobs creation. Traditional long-term space plans, beginning with the 1967 "Chapman Report," known more formally as "Upper Atmosphere and Space Programs in Canada" by J.H. Chapman, P.A. Forsyth, P.A. Lapp and G.N. Patterson, were far larger and contained considerably more information collected from a variety of government departments. The first describes current and projected government, university, and industrial programs for the 1961 to 1971 period in considerable detail. Statistical information on these programs is compiled from the original sources. The comments and recommendations of the study group are included. The second part is devoted to the texts of agreements, memoranda of understanding, and other international arrangements in effect on October 31, 1966, and which record the official undertakings with regard to the Alouette-ISIS Scientific Program, the International Communications Satellite Program, the St. John's, Newfoundland, Tracking and Telemetry Station, and the operation of the Churchill Research Range. Part three of the report is in the nature of an appendix to the first part, presenting the High Altitude Research Program of McGill University in considerably greater detail. This was a reasonably comprehensive listing of pretty much everything the Canadian government was supporting in this area at the time. John Chapman (1921 - 1979) and another of his legacies, the Alouette-1 satellite. As outlined in the Fall 1992 Institute of Electrical and Electronics Engineers (IEEE) Canadian Review post, "The 30th Anniversary of Alouette I," Chapman "was convinced of the need to develop the capability to design and build space hardware in Canadian industry and to move away from the practice of relying solely on the expertise of the government laboratories. As a result, Alouette II and the ISIS satellites were built, with steadily increasing participation by Canadian industry." Photo's c/o IEEE Canada. A series of discussions on "Canada's Legacy in Space," including the role of space in developing Canadian science expertise and a short essay on "The Socio-Economic Benefits of Space," which covers metrics related to gross domestic revenues, employment and industry and private sector opportunities for future growth. An overview of "Canada's Vision for Space," focused around science and the need to utilize space focused technologies as "a key element" of the Federal Government’s 2017 Innovation and Skills Plan, focused around generating new middle class jobs in innovative sectors. Several pages on "Delivering the Vision," which included $1.9Bln CDN for a next-generation AI-enabled deep-space robotic system (essentially, a new "Canadarm") for the US led Lunar Gateway program, a re-commitment to the Canadian astronaut program, substantial new educational outreach and several other programs relating to solving "everyday challenges" for Canadians. While the new policy does mention "science," at least in passing, it certainly doesn't attempt to inventory space focused initiatives taking place across Canada through the National Research Council (NRC) or other government and private sector organizations. Such an inventory, a standard component of the traditional "whole of government" approach to the problem is certainly not impossible to generate. A good place to start could be the Industry Page on this blog. The lack of an inventory would suggest that the new policy is not the comprehensive, final word on Canadian space initiatives pitched by the Canadian government. Also, while the new strategy does mention the need to "create a modern regulatory framework," it doesn't go into any detail on which specific regulations need to be addressed and updated. As outlined in both the December 14th, 2018 post, "2019 Federal Pre-Budget Consultation Report Mentions "Significant, Ongoing Investments to Advance Canada’s Space Program"" and the March 5th, 2018 post, "That Commercial Ground Station Built by New North Networks in Inuvik Still Can't be Used," specific areas requiring updated legislation have certainly presented themselves to those willing to do the appropriate research. Others are slowly coming to the conclusion that the new space strategy is neither a panacea nor a "whole of government" document. As outlined in the March 25th, 2019 SpaceQ post, "Opinion: Finally, a New Canadian Space Strategy – But Wait, What do we do With This?," a few are beginning to ask about the absence of a Canadian government commitment to regulatory reform in the document. As outlined in the April 1st, 2019 Ottawa Citizen post, "Steer: Space needs more Canada – but Canada needs a better approach to space," at least one person, Dr. Cassandra Steer, an independent space security consultant contracted to Kanata ON based Space Strategies Consulting Ltd., has also questioned the absence of commitment to international space security initiatives in the new space policy. These concerns are just the beginning. Expect more to surface over the next few months as the full extent of the Liberals failure in the area begins to sink in.